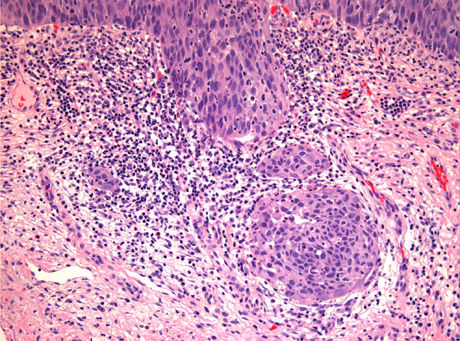 Cervical squamous cell carcinoma in situ. H&E stain. Squamous cell carcinoma of the uterine cervix, also cervical squamous cell carcinoma, is the most common primary malignancy of the uterine cervix. Most common type of cervical cancer. Human papillomavirus (HPV) infection, esp. "high risk HPV". HPV 16 closely assoc. with SCC. May be challenging to determine. Extra large nuclei, i.e. nuclei 5x normal size. Stromal inflammation (lymphocytes, plasma cells). Desmoplastic stroma - increased cellularity, spindle cell morphology. Squamous metaplasia of the uterine cervix - if you can trace the squamous cells from a gland to the surface it is less likely to be invasive cancer. 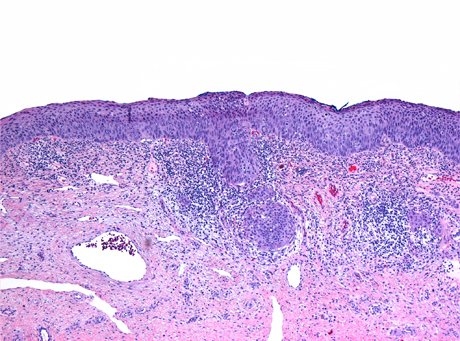 High-grade squamous intraepithelial lesion +/- endocervical gland involvement. Microinvasive cervical SCC - low mag. (sunnybrook.ca). Microinvasive cervical SCC - high mag. (sunnybrook.ca). Cervical SCC - low mag. (ucsf.edu). Cervical SCC - high mag. (uscf.edu). Basement membrane (where it invades) to deepest point. Stage Ib - clinical diagnosis. Definition of stage Ib: clinically visible. The SGO criteria the prefered by North American gynecologists. Factor VIII - to look for LVI. Number of blocks with tumour. - FRAGMENTS OF INVASIVE SQUAMOUS CELL CARCINOMA. -- DEPTH OF INVASION AND LENTH OF TUMOUR CANNOT BE ASSESSED. -- LYMPHOVASCULAR INVASION NOT APPARENT. - INVASIVE SQUAMOUS CELL CARCINOMA, MODERATELY DIFFERENTIATED, FRAGMENTED. Tumour Site: Cannot be determined. Tumour Size: Cannot be determined - see comment. Histologic Type: Squamous cell carcinoma, keratinizing. Histologic Grade: G2: Moderately differentiated. Stromal Invasion: Extent cannot be assessed - see comment. in the plane of section. Fragmentation and lack of normal histology preclude orientation. As both the in plane dimensions exceed 0.7 cm, this is at least a pT1b. - INVASIVE SQUAMOUS CELL CARCINOMA, pT1a1, pNx. -- MARGINS NEGATIVE FOR MALIGNANCY. - UTERINE TUBES WITH CHANGES COMPATIBLE WITH LIGATION, NO SIGNIFICANT PATHOLOGY. - OVARIES WITHOUT SIGNIFICANT PATHOLOGY. ↑ De Boer, MA. ; Peters, LA. ; Aziz, MF. ; Siregar, B.; Cornain, S.; Vrede, MA. ; Jordanova, ES. ; Fleuren, GJ. (Apr 2005). "Human papillomavirus type 18 variants: histopathology and E6/E7 polymorphisms in three countries.". Int J Cancer 114 (3): 422-5. doi:10.1002/ijc.20727. PMID 15551313. ↑ 3.0 3.1 URL: http://sunnybrook.ca/content/?page=dept-labs-apath-gynpath-imgat-cvx-mal-microiscc. Accessed on: 2 May 2013. ↑ Cotran, Ramzi S.; Kumar, Vinay; Fausto, Nelson; Nelso Fausto; Robbins, Stanley L.; Abbas, Abul K. (2005). Robbins and Cotran pathologic basis of disease (7th ed.). St. Louis, Mo: Elsevier Saunders. pp. 1077. ISBN 0-7216-0187-1. This page was last modified on 15 August 2017, at 09:58.